It has been a busy month at Mockley Manor Care & Nursing Home in Ullenhall as the residential home in the heart of the Warwickshire countryside unveiled a new palliative care unit and celebrated the dedication of some of its most loyal carers. 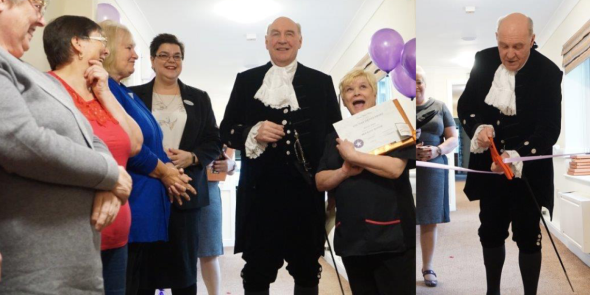 The High Sheriff of the West Midlands, John Hudson, was the guest of honour at the February Opening Day to unveil the new dedicated palliative care unit. To mark the occasion, residents and carers put their innermost thoughts and wishes on paper and then released them into the air in balloons. Run by family-run providers Coate Water Care since 2012, Mockley Manor has undergone extensive refurbishment in order to provide the perfect setting for quality residential care and respite care, including 24-hour nursing care for people living with dementia. “We particularly specialize in end-of-life care, so the opening of our new eight-bedroom palliative care unit is an important addition to our facilities,” says Rachael Crocker, manager at Mockley Manor since 2010. The Open Day also coincided with National Dignity Day. Led by the National Dignity Council, Dignity Champions form part of a nationwide network of 90,000 individuals and organisations who work to put dignity and respect at the heart of UK care services. Congratulations to the following recipients of long service awards. Mockley Manor wouldn’t be the same without you!